We’ve already seen the excitement the new park offers to guests and have no doubt it will impact the entire region in a very positive manner.” –Supoj Tantichirasakul, chairman of Pena House Public Co. Ltd.
Istanbul, Turkey — Santorini Water Fantasy, the new waterpark add-on to the existing Santorini theme park, has officially opened last fall. The opening event-attended by actress “Mew” Lalita (Panyophat) Sasiprapa and Thai rock bands Modern Dog and Jetset’er, who also performed at the media event, as well as members of the development team and local politicians – was held in September 2013.The US$3.25 million (100 million THB) waterpark is adjacent to the Cha-Am Premium Outlet Mall in the southern part of the Phetchaburi Province in central Thailand close to Bangkok.-the park has attracted thousands of guests eager to enjoy its US$3.25 million (100 million THB) aquatic attractions. 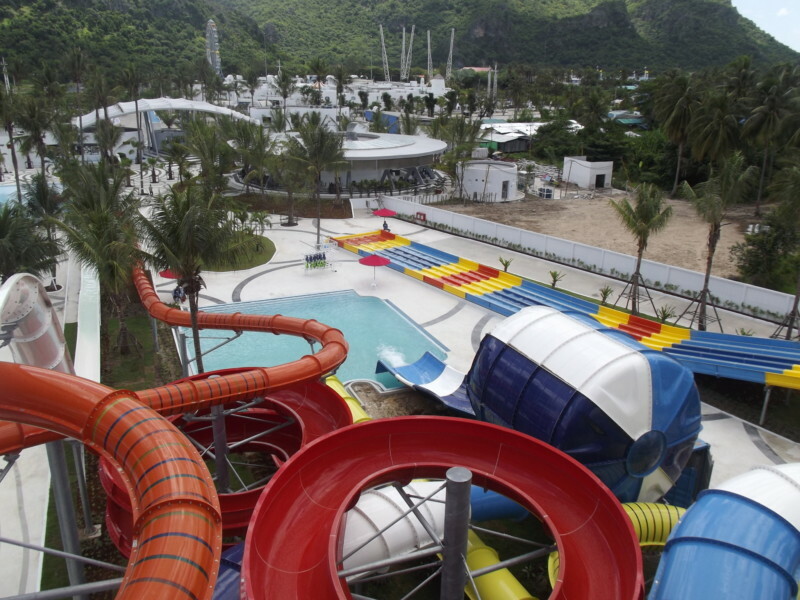 The new waterpark, as well as the existing amusement park and retail center, is located in the southern part of the Phetchaburi Province in central Thailand. The facilities were conceived by Supoj Tantichirasakul, chairman of Pena House Public Co. Ltd. and its subsidiary. Those in the fashion world may recognize Tantichirasakul’s name due to his long experience as a fashion-apparel maker. In the business world, however, he is known for his creative thinking in developing new concepts for tourism. Owned by Supoj Tantichirasakul, chairman of Pena House Public Co. Ltd., the two parks are adjacent to the Premium Outlet Mall at Hua Hin. Pena House originally developed the mall and then added Santorini Park’s rides, shops and restaurants. Tantichirasakul says the new waterpark is expected to support his plan to transform Cha-Am’s main road into a new “Western Gold Coast,” similar to Australia’s Gold Coast. His company is expanding investments in Cha-Am, including other amusement parks and waterparks. “Santorini Water Fantasy is a thrilling new addition to our plan for enriching the tourism in this area,” Tantichirasakul adds. The park’s main attraction is its King Cobra waterslide. Featuring bold red, black and white scales, the King Cobra’s impressive veneer extends along its massive 50-foot (15.24-meter) height and 260-foot (790-meter) length. The slide enables two riders to race along a circular path of twists, turns and surprises. Riders reach speeds of up to 32 mph (51 km/h) via water pressure of 3,875 gallons (14,668 liters) per minute through open and closed tubes. The ride ends just after they endure a heart-pounding plunge of nearly 25 feet (8 meters) down a 50-degree slope. Looping Rocket. This high-adrenaline ride offers one of the highest drops riders can experience. The ride features Polin’s exclusive “Magic Shine” technology in translucent colors. Windigo. Riders on mats begin this attraction within enclosed slides that transform into high-speed multi-racer lanes. It offers the flexibility of including “Kamikaze” or “Freefall” options, and its high-capacity capability will keep lines moving. Other rides include Polin’s Freefall, Aquatube, Rafting Slide, Black Hole, Kids Freefall, Space Hole, Kids Octopus Slide, Mini Pirate Slide, Turtle Slide, Rabbit Slide, Mini Rainbow Slide, Giraffe Shower, Mushroom, Aquatower Type 600 which is a very popular water play structure, Frog Slide, Baby Octopus Slide. The waterpark also features a giant wave pool, a wide variety of food and drink offerings, secured lockers, air-conditioned poolside cabanas and shopping. An especially unique offering is a specially designed camera system that allows guests to connect in advance with their Facebook accounts. Then, when photographs are taken of guests as they ride various attractions, the images are automatically uploaded to the guests’ Facebook pages.